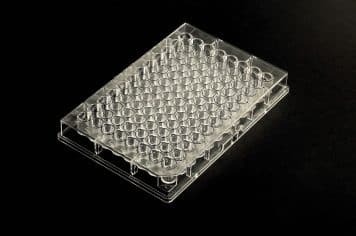 These surfaces are ideal for binding assays when available antibodies are in low quantities or they denature and become inactive upon direct adsorption to polystyrene plates. 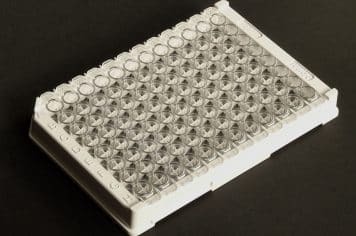 96-well microplates, solid or with 12 removable 8-well strips. The microplates, if unopened, are stable refrigerated until the expiration date printed on the label. If opened, store in closed pouch with desiccant and use within the expiration date. Click on the secondary antibody link to scroll down the page to the relative section. Affinity purified goat anti rabbit IgG specifically binds the Fc region of rabbit immunoglobulins , with minimal crossreaction to human serum proteins. Affinity purified Goat anti rabbit IgG Fc is coated using 100 μl/well. The strips are post-coated (blocked) for low non specific binding and long-term stability. Microplate was saturated with rabbit IgG at a concentration of 1.0 μg/ml (100 ng/well) in an ELISA format using goat anti rabbit IgG (H+L)-HRP as detector and TMB as substrate. Rabbit IgG was detected at a concentration significantly above background in an ELISA format using goat anti rabbit IgG ( H+L )-HRP as detector and TMB as substrate. Microplates show a CV% less than 5 when used as a catcher of rabbit IgG in an ELISA format using goat anti rabbit IgG ( H+L )-HRP as detector and TMB as substrate. Affinity purified goat anti mouse IgG specifically binds the Fc region of mouse immunoglobulin subclasses 1, 2a, 2b and 3, with minimal cross-reaction to human, bovine and rabbit serum proteins. These plates may be used as solid support for most sandwich ELISAs utilizing a mouse IgG capture and a non mouse IgG detection antibody. Other applications include competitive ELISA, IgG isotyping and hybridoma screening/selection. Affinity purified goat anti mouse IgG Fcγ (subclasses 1+2a+2b+3) is coated using 100 μl/well. The strips are postcoated (blocked) for low non specific binding and long-term stability. Microplate was saturated with mouse IgG at a concentration of 1.0 μg/ml (100 ng/well) in an ELISA format using goat anti mouse IgG (H+L)-HRP as detector and TMB as substrate. Mouse IgG was detected at a concentration significantly above background in an ELISA format using goat anti mouse IgG (H+L)-HRP as detector and TMB as substrate. Microplates show a CV% less than 5 when used as a catcher of mouse IgG in an ELISA format using goat anti mouse IgG (H+L)-HRP as detector and TMB as substrate. Founded in 1992, is an engineering company, focused on surface modifications for biomedical applications. The company mission is to support life science manufacturers and researchers with: CUSTOMER SERVICE, RELIABLE PRODUCTS and COMPETENCE.